Some of the XO components, like the mesh network, integrated camera, and screen resolution had a strong effect in its favor. It's worth noting that all the components which the Education Commission had requested for the laptops were included in the call for bids' technical terms and in its scoring. It also appears to be a good thing that Villa Cardal's XO laptop experience can be built on. As far as the servers go, INCO (Interamericana Computing) made a significant offer of IBM servers with 2 gigs of Ram, 2 x 120 gig hard drives, and installation service at the price of US$610. This was the winning bid. As regards connectivity, the proposals presented were very expensive. This was most likely due to the challenging requirements for home coverage in the call for bids. Latu's technical team along with Antel, have been doing excellent work on this and have attained the experience to do it on their own if this should become necessary. The Free Deed Foundation is preparing to conclude an agreement worth approximately $200 million with the Taiwanese Asustek Computer Co. on the purchase of a million laptop computers. The Free Deed Foundation is sponsored by affiliates of Oleg Deripaska. Basic Element spokesmen explained that the computers will be used in Russian schools. But like the Reliance Anil Dhirubhai Ambani Group press fluff that's attempting to buzz OLPC India into existence from a very small pilot, you shouldn't believe everything you read about OLPC or its competitors. But we wanted to show to them how Uruguay, just as Brazil and Argentina, is in the stage of initial launching of this project. So that Uruguay counts on certain privileges to advance in this project with respect to other countries, even countries of the region. Uruguay is going to be the first country in America in covering to all the children in scholastic age and it can do it because we are small, because it has a reduced number of children compared with whom they can have or those that have Brazil or Argentina. This is going to allow to us to advance quickly then step by step surely, but quickly, in covering all the children with our state schools. OLPC Uruguay will motivate Intel to advance quickly, step by step, to develop an XO chipset, an AMD excluder for the XO-2 computers if you will. Oh wait, Intel just did. That's certainly great news! Looking forward to hearing more details at that press-conference, I'm especially interested in seeing when exactly the first X0s are going to be deployed. The decision to go with off-the-shelf IBM servers is also an interesting one. Of course it comes as no surprise given that OLPC's own school server still seems to be at an infancy stage. I guess that's also why they're currently looking for http://laptop.org/en/jobs.shtml a School Server Architect and School Server Software Engineer. I also wouldn't be surprised to see Intel come up with their own design for the school servers... ;-) Even though I generally still don't understand why OLPC didn't go with something such as the VIA PHD servers because from a hardware and system point of view these are very suitable machines for that task. With regards to OLPC India, I talked to Carla Gomez (OLPC learning consultant, she also writes most of the articles about the school pilots) yesterday and she told me that "Details about India's pilot will be up soon." Interestingly Walter Bender also mentioned to me that "only India has B4s in any quantity", as most of the other X0s deployed in those schools are actually B2s with 4xx builds running on them. That hardware/software combination isn't really representative of the current state of things because things such as collaboration and the Journal weren't really integrated at that stage. So what I also told Carla and Walter is that to me the reports coming from India and other trial schools that have significant numbers of B4s deployed are going to be much more interesting and relevant to read. "it can do it because we are small"
Uruguay is indeed. 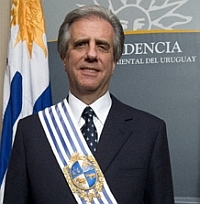 You can easily compare Uruguay to a Brazilian State as Rio Grande do Sul, in terms of economy and population. But the fact that Porto Alegre still just a Pilot program and Uruguay has sucessfully ordered real laptops is probably a testimony on why small is better. Wayan, isn't Yahoo notorious for expiring its news stories quickly and rendering links to them stale? Maybe http://www.pcworld.com/article/id,138437-c,intel/article.html would be a better idea. This is simply so awesome, I wonder how fast, how well Uruguay will implement OLPC, how other countries will implement compared with Uruguay, how the pedagogical and software sectors of each country will work with OLPC to make sure the laptops are used as positively as possible. Intel by announcing the Diamondville CPU architechture are confirming that they have no serious plans with the Classmate PC and Asus Eee computers to become so called low cost computers in their current designs. Simply cause the ULV platform is not suited for low enough power consumption and low enough cost. But even with Diamondville coming in April, AMD coming with its next generation Geode by the end of this year, and VIA possibly chipping in with its fanless x86 proposition, it's still going to take probably until the end of 2008 for the XO-2 to be ready, by then 10 million XO-1 will have been produced if deployments go smoothly with every deployment being extremely successful. Wow - congrats. This is awesome news - I'm looking forward to seeing other regions adopt this type of technology. Charbax said: "...AMD coming with its next generation Geode by the end of this year..."
I must have missed something: AMD will be releasing new Geode processors? When? At what speeds @ what power consumption? Do you have any links or details about the whole thing? I'll try to find the link, I cannot find it right now, but I'm quite sure I read within the last couple months on some reliable source somekind of press release or announcement about AMD's next generation Geode-like ultra low power processor to come out soon, thus probably will be AMD's proposition for the XO-2 and competing also with Intel's Menlow and Diamondville. Those who claim that olpc is an unworkable business idea need to explain why the world's leading cpu producers, who surely know a thing or two about business, are, at considerable expense, competing to be the supplier to the next generation of olpc laptops. In response to Eduardo Montez, because OLPC's business plan has larger goals than merely moving a large number of laptops. As you may recall, it was said to be "an education project, not a laptop project", and my criticisms were of their approach to education. The engineering work of designing the XO is first rate, a necessary advance which will benefit many projects and will propagate through many future generations. 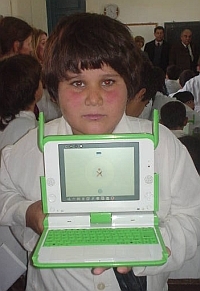 My fear was that by bungling the implementation OLPC would give a bad name to any project working with low-cost computers in the developing world. Now, however, it appears that the educational goals of the project have been placed well behind the goal of volume shipments. This approach is familiar to any laptop manufacturer, so others are coming up with products or the promise of products. Negroponte's state-mandated constructionist dream has evaporated, fortunately with a lot less damage than I had feared. States like Uruguay and Peru are buying in quantities suitable for meaningful pilot projects, which can only be to the good if the projects are integrated with academic studies (I have raised questions about Nigeria in this respect). Lee: come on, we're just seeing the first order confirmations now, and the hardware is very close to being finalized for the first shipments. what does it mean? That now is a good time to start looking at the feasibility of the project from an engineering and financial point of view. Don't you think it's a bit early to judge the educational potential of the project? For one thing, we don't how many more laptops will be ordered. But maybe I didn't get you... Is your point that the percentage of children getting a laptop will be too low for the "constructionist" idea to work, or that other aspects (ie. not the number of laptops) have been neglected? In the latter case, can you elaborate on these neglected aspects? I half agree. I think olpc is still pushing the constructivist model, because it is still working away at software like sugar and the journal, that are designed for it. I think they are hoping it will catch on in the long-term. There's a big difference between "hoping it will catch on in the end" and expecting that countries will place orders in the millions at once (the original plan), based upon the self-evident virtues of constructivism. J can look up my original blog postings for the answer to his question about the neglected aspects. Just look up my name and "problems with the $100 laptop" on a search engine. There are also some postings here. I feel reassured that people are less susceptible to fervor inspired by technology than OLPC had assumed. "it appears that the educational goals of the project have been placed well behind the goal of volume shipments...Negroponte's state-mandated constructionist dream has evaporated"
The educational goals (and yes, that includes constructivism) are central to OLPC effort - please don't confuse adjustments to marketing strategy (and very needed too) with the goal itself. "OLPC Uruguay will motivate Intel to advance quickly, step by step, to develop an XO chipset, an AMD excluder for the XO-2 computers if you will. Oh wait, Intel just did." Michail Bletsas attended a technical meeting organized by LATU to discuss the technical requirements for the connectivity infrastructure of the schools in the Colonia and Durazno districts: the next (after Florida) to get XO laptops after school commences again in March. The main purpose of the meeting was to discuss the main requirements of the RFP that is going to be issued in the next few days. Michail also spent several hours at LATU discussing connectivity details with the Ceibal team and left Uruguay impressed with both the enthusiasm of the people involved in the project as well as their accomplishments.